Orbotix, the maker of the Sphero — a rolling robot ball that can be controlled by iPhone or Android — is ready with an updated version of the gadget. Version 2 of the device sells for the same $129, but is faster, brighter and can now jump ramps. A new, removable bumpy rubber shell allows the already waterproof ball to tackle new terrain, such as mud and ice. On the inside, the ball features more and brighter LED lights, as well as a custom Bluetooth chip that the company said will improve handling by speeding up communication between the ball and the phone controlling it. Rather than giving buyers the full speed and new tricks out of the box, Orbotix is adding some game elements to the mix, requiring customers to use a virtual currency earned through play time to upgrade the device. Preorders for the new Sphero start on Aug. 14, with the devices to be sold in Apple retail stores and Brookstone, among other places. For Apple’s stores, there is a version that lets owners peek inside the device, while Brookstone’s bundle includes glow-in-the-dark ramps. 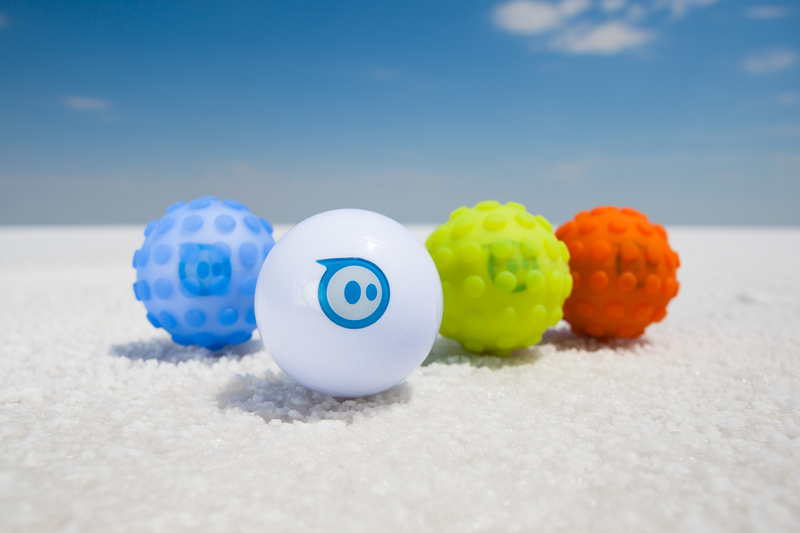 Orbotix quietly raised an additional $4 million in funding in May to help pay for increased production of the new ball ahead of the holiday season. The Foundry Group, whose Brad Feld is on the company’s board, led the round. The company hasn’t given sales numbers, but marketing VP Kelly Zachos said the company sold every ball it could make last holiday season, and is nearly sold out of its 1.0 device, with tens of thousands of Spheros sold in all. Orbotix is also upping the number of apps for Sphero, a collection that already includes augmented-reality games and options that let budding programmers write code to control the ball’s movements. There are 25 apps today, including those from Sphero and outside companies. Another five are expected this year, with one coming from Orbotix and four from third-party developers.